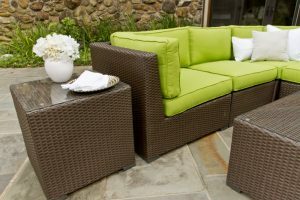 A person looking to purchase wicker garden furniture items today ends up with two major options, in terms of where and how he or she can purchase the said furniture items. On the one hand, such a person can simply venture into a local (brick and mortar) furniture store, and procure the desired wicker furniture items there. Alternatively, such a person can log onto the Internet, search for one of the online stores selling wicker furniture items, and proceed to procure them there. Our focus here is on the latter approach, the approach of buying wicker garden furniture items online. We are interested in understanding the advantages and disadvantages of buying the said furniture items online. The ‘cost’ advantage: it is a well known fact that, generally speaking, online stores of all types (including furniture stores) tend to sell their merchandize at pocket-friendly prices. This is something they do because, for one, they operate in a much more competitive environment. It is also something they are in a position to do because their overheads are somewhat lower. Thus, people who buy wicker furniture online tend to end up paying prices that are somewhat lower than those paid by people who opt to buy wicker furniture in brick and mortar stores. The ‘convenience’ advantage: to buy wicker garden furniture online, you don’t have to leave your home or office and start walking up and down furniture stores, trying to identify ideal items. Rather, you just log into a furniture store’s retail website, select the furniture items you fancy through their pictorial representations, pay for them using credit or debit cards, and wait for their shipments to be facilitated. The furniture items are then shipped right up to your gate. Now that is convenience. The ‘inventory’ advantage: seeing that online furniture stores tend to be so well-stocked, by opting to procure your wicker garden furniture there, you get a wider variety of furnishings to select from. The ‘latency’ disadvantage: the person who ventures into a local furniture store and buys wicker furniture there has the opportunity to go home with the furniture within the same day. But the person who buys the same type of furniture online has to wait for some days (and occasionally, for some weeks in fact) before getting to use the furniture. This is somewhat inconvenient. The ‘shipping cost’ disadvantage: much as the furniture items sold online tend to go at rather pocket-friendly prices, it is always worth noting that after purchase, they have to be shipped to the buyers. That in turn necessitates the incurrence of shipping expenses, which can often raise the actual cost of the furniture very substantially.The logistical disadvantage: often, the online stores where people buy furniture items turn out to be in other countries (different countries from their own). This brings about the logistical complications associated with import-export situations. By the time they are through with the whole deal, they find that they have spent too much time on things like shipment follow-ups and customs clearance procedures. Should You Purchase Used Cushions?